Belt fed GPMG, a modernized version of the MG42. One of the best machine guns ever made. 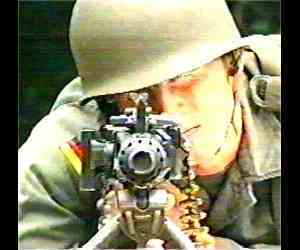 The MG-42 machine gun was designed to replace the German MG-34. The MG-42 was to be mass produced and to be more rugged in the field than the hand-crafted MG34 which demanded more maintenance and care. The result of these efforts created perhaps the World's best Machine gun with a unique "Delayed Blowback" system of firing. Durable, dependable and possessing an incredible rate of fire made this weapon the pride of German Infantry and the scourge of the Allies. Its distinctive firing sound of ripping canvas punctuated the Battlefield and was easily recognizable by Americans because the MG 42 fired three times as fast as any Machine gun in the American arsenal. By 1944 - the German Squad and its Tactics revolved around the MG-42. The Squad's main focus in a firefight, was to get the MG42 up and firing on the Enemy as quickly as possible, with the rest of the Squad ready to bring more Ammo to the Gun if need be. In addition, the Gunner of the Squad's MG-42, was the Unit's Best and Steadiest Soldier. The MG-42 may be fired from its Bipod (Light MG), on a Tripod (Medium) or from a Tripod and with a heavy barrel (Heavy). The MG42 had the highest rate of fire of any infantry machine gun during World War II. In fact the German Infantryman was taught to conserve ammunition and only employ the high rate of fire when necessary. Tripod / Bipod The MG42 was designed to fit on an Ingenious Tripod system. This system was designed so as to fit a MG42 with no modifications to the gun, in fact the Bipod on the MG42 would remain as it "sat" in the tripod. Because of the Tripod system, the MG42 can be removed from the tripod and be used as a LMG. Because German Fallschirmjagers (Paratroopers) often lacked supporting weapons during operations, the FG-42 was developed to give each individual paratrooper more firepower. A cross between a light machine gun and an assault rifle, the gas-operated FG-42 could be fired Ingeniously Single- Shot with a closed rifle bolt or Full auto with an open bolt. The FG 42 also featured a bipod, an attachable bayonet, and a 20 round box clip that was fitted above the trigger on the left side of the weapon. The side location for the clip however was found to snag on equipment and to unbalance the gun when it was fired. Overall, the FG42 was a brilliant design whose development would lead to the creation of the MP-44 and assault rifles as they are known today. Because of the complex nature of the FG 42, manufacturing the weapon was difficult. Only 7,000 FG 42s were produced before war's end. 6. or adapted to several Military vehicles (Coaxial - at the Turret Top / Commander Hatches - such as FlaMg).